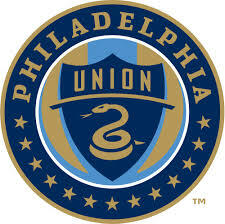 We're an official PUB PARTNER of the Philadelphia Union (and the closest one to the park!). Stop by before, during or after a game! You can be sure we'll have plenty of swag to give away throughout the season. ORDER ONLINE - Click here!!! We're glad you've stopped by. We hope that you'll stop by our restaurant, as well. We'd like to get to know you. Owned and operated locally, we're a family restaurant - right in your neighborood. 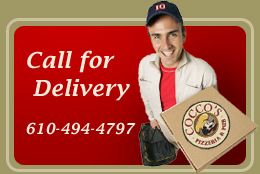 Cocco's Pizza sauces and recipes have been handed down for generations, and are what make us one of the best pizzerias in the county! You can taste the difference! Our hand-tossed pizzas are made fresh when you order them, and are still hot from the oven when you pick them up, or eat in the dining room. Our hoagies and club sandwiches are perfect for lunch or dinner. For parties (large or small), we offer a wide assortment of hoagie trays, wing trays, 3, 4, 5 and 6ft hoagies, salads, and more. There are, of course, discounts for orders of large quantities of pizza! We welcome your groups in the dining room, or we will prepare your party extravaganzas for you to pick up or have delivered. We’ll take care of everything your guests might need, including plates, forks, knives and napkins, not to mention the fixings you’d expect, like parmesan cheese, and red pepper flakes.